Kiting 2005 #9 (Sat 19 Mar): Blowin' good (15-20 knots). Went to Botany Bay with N & G. Kitted up just south of the Long Reef shop (BRIGHTON-LE-SANDS). Reasonable board action, getting used to it - this really only being my second to third session out on the board properly. I had the hangover from hell so started to flag after an hour and a half's messing around. N went on for longer and managed his first upwind action, though strangely could only do it in one direction ie left foot first. Wind was blowing roughly cross shore from the south-west. I found it strangely difficult to get up left-foot first. Right-foot first (ie towards the sea rather than the shore at Brighton on a southerly) was loads easier. I played around a lot with trying to stand better. Very conscious of a very poor stance, taking too much weight on the bar, and so not allowing sheeting-out and the kite to depower, hence slowing and dropping back into the water. Seems strangely difficult to manage this. N having the same problem. G took some video shots on an excellent zoom, and that confirmed it all - looking terrible - knees bent, leaning toward the kite, taking the power through my arms! Much work to be done. But now it's a helluva lot more fun. Kiting 2005 #8 (Sat 12 Mar): AMAZING. Had an amazing sess with N down at Brighton-le-Sands. Great wind. I was on the board and FLYING. Pretty much went half the way from Brighton to Dolls Point. The wind was cross to on. More cross which was great. Mostly 18 knots (at the airport, not far from us).....GREEN arrows on seabreeze.com.au. I was on the board no problem. I stayed on the board for some really long runs. Messed around with my stance a bit with not much luck. Played with retaining momentum at the top of the window and the sides. Mostly left leg first, though did a bit the other way round - but that would sort of mean coming to shore more quickly. Tried - unsuccessfully - to go upwind. But I'm sure that's not far away now. Top day out. Made such amazing progress in a short space of time, having been stuck for so long before that. Very comfortable flying the kite now - one handed, no handed!, whilst submerged in the water and blinded! N did good as well - tried to get upwind bit also couldn't. Kiting 2005 #7 (Sat 5 Mar): My birthday outing - K treated me to a trip to BYRON BAY and I was taking full advantage of birthday-boy status so we spent Saturday afternoon playing with kites. Byron is a beautiful spot, the Bay has a wide sweeping beach, roughly north-east facing, with enough curve to turn noreasterlies into cross shore. We based ourselves on the easterly side, which unfortunately has a load of kids playing around & surf lessons in action, though later in the afternoon it cleared up a bit. There's another beach round the corner that is long and straight and faces south-east. So it was very windy. I was nervous, and without my kite-buddy more cautious than usual. The waves made it look more scary. The wind was very gusty - sand blowing along the beach knots - so we waited around a while before launching. In the meantime I taught my beautiful assistant some of the theory. Eventually I couldn't take it any more and we got out into the water. First go was the K&A tandem run. K did a fine job of launching the kite, then grabbed my back and I took her for a spin. That was good fun and there was enough wind for both of us to get some decent speed body dragging through the waves. We landed glitch-free, giving me the confidence to go it alone with the board. Now at this stage I'd been on the board a few times, never in waves, and never managing to stay on it for too long. I left the leash behind as I'm starting to get more paranoid about getting a fin in the back of my head - especially in choppy open waters. The water is reasonably shallow for far enough out to be able to stand and mess around. And I did that for a few seconds. Only a few outings ago I was struggling to get my feet in the slots. Now that - and flying the kite one-handed - is easy. Feet in. Swoop the kite down from 12 to the right and I'm off! Through the waves without losing the board, for three up/downs of the kite before I lose momentum. 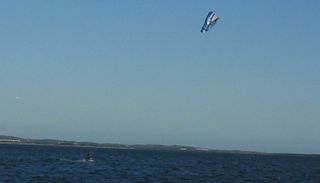 Much more of this before I lose the board and crash the kite. But I got a relaunch and retrieved the board and went again. A couple more goes of the same and I was a very happy chappy. Board action; in the waves; without a leash; good relaunches; and K's now proficient at launching and landing and she's had a taster of being in the water. A top day. It's birthday time and I've done well so far - "The Complete Kiteboarding Guide" (DVD made by kitefilm.com) arrived in the post today. I'll post my review and top tips from this in the next week or so. And yesterday, the book "Kiteboarding Vision" turned up (published by the IKO guys). All very exciting. Clearly my lack of progress is being pitied by some and they're trying to help me on my way...!